Today was my first storytime in a couple of weeks and (to be completely honest) I was dreading it a little bit. Don't get me wrong. I love storytime, I do. But after having a couple of weeks off, I was afraid I'd be rusty. I was afraid I wouldn't pick good books. Heavens, I might even have forgotten some of the words to Shake Your Sillies Out! Luckily, none of those situations came to pass and we actually had quite a good time. In fact, I think I might have some new favorite storytime books and I just had to share them. First is one that my coworker read. I'd never heard of it before, but it was a delightful story that kids and parents (and librarians) all enjoyed. Sadly, it looks like The Tiger Who Came to Tea by Judith Kerr is out of print, but I highly recommend it if you can get your hands on it. 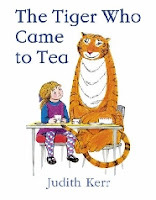 It was originally published in England and it tells the story of that fateful day when a tiger came to tea. Not only did he eat up all the sandwiches and all the buns, but he ate all the food in the fridge and the pantry as well! When Mum and Dad discover that there's no food left, the family goes to eat at a cafe and then buys some groceries, including a giant can of tiger food in case the tiger ever stops by again. 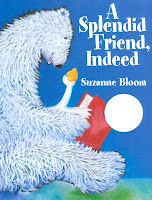 And finally, we just got in a big book version of A Splendid Friend Indeed by Suzanne Bloom. This is a great, great book to have as a big book because the illustrations are so important to the story. A polar bear is sitting alone, trying to concentrate on reading, writing, and then thinking while his friend the goose insists on interrupting him. The polar bear's expressions are priceless. Although the text of the story doesn't mention anything, you can see the bear getting more and more annoyed. But in the end, the bear realizes that goose wasn't trying to be annoying, he was just trying to talk to his friend. All is forgiven and bear and goose remember that they are splendid friends indeed. 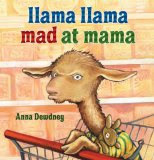 Funny and sweet, this book has great opportunities for dialogic reading. Ask kids how they think bear is feeling or how goose is feeling. Have they ever felt the same way? Maybe with a brother or sister? We always include songs or action rhymes in our storytimes and today we ended with a rousing rendition of Old MacDonald Had a Farm. My fellow librarian B accompanied us on the ukulele and I stood behind our giant felt board with a hidden stash of puppets. When we came to each animal, I held it up above the felt board, dancing around with it. We did the typical animals... pig, cow, cat, dog... and then threw in a HUGE tiger at the end just for fun. My library is lucky enough to have a giant closet full of puppets and we try to use them at every opportunity because the kids love them so. So, there you have it. My first storytime of 2008 was a hit and I'm just hoping it's indicative of what's to come throughout the year. Happy Anniversary Abby! The Tiger Who Came to Tea sounds like a wonderful story...I'm going to have to hit up some used bookstores. Your post brought back lots of fun memories of story time at the library when I was a child. I can't wait until my daughter is old enough for this!